No, This Isn't Scifi. It's an Actual Spaceplane, Getting Fueled Up. The European Space Agency is about to launch its remote-controlled experimental spacecraft, IXV (Intermediate eXperimental Vehicle), on February 11, from Europe's Spaceport in Kourou, French Guiana. What you see above is that craft being fueled with hydrazine maneuvering propellant. 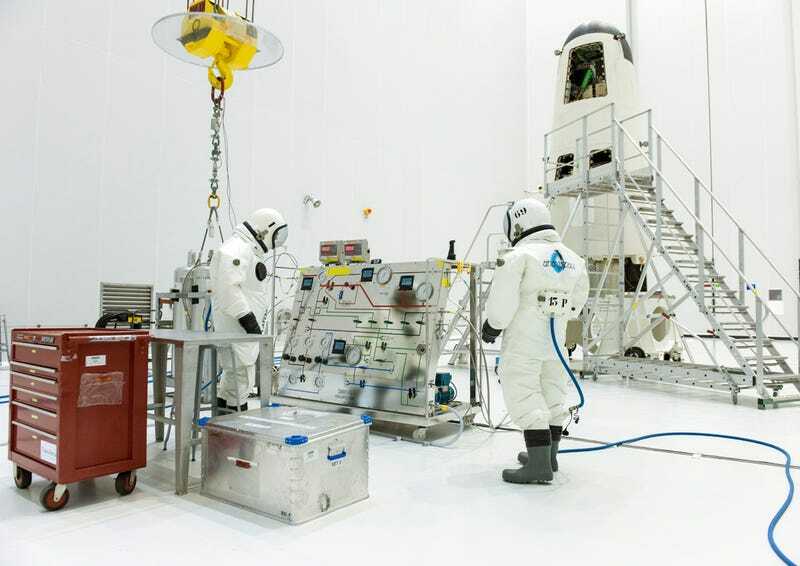 It's all taking place in the S5B hall of the Spaceport's large S5 payload preparation facility. It's like a scene from 2001. This mission will provide vital flight data for Europe to forge ahead in developing systems and advanced technologies for transportation systems of the future. [...] The mission will last 100 minutes from liftoff to splashdown. Weighing around two tonnes and the size of a car, IXV is a snug fit inside Vega's protective fairing. The two-piece shell will open to release the spaceplane at an altitude of 320 km. IXV will coast to up to 420 km and then begin its reentry phase, recording a vast amount of data from a large number of conventional and advanced sensors. The entry speed of 7.5 km/s at an altitude of 120 km will create the same conditions as those for a vehicle returning from low orbit. IXV will glide through the atmosphere at hypersonic speeds to test new European reentry technologies before parachutes deploy to slow the descent for a safe splashdown in the Pacific Ocean. That, and looking really freaking sweet in its hangar.